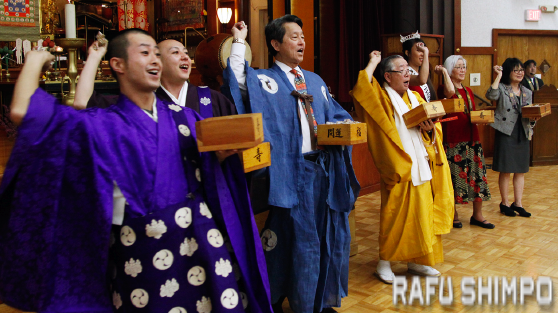 Setsubun and Hoshimatsuri, the traditional Japanese rite of the new spring, will be observed on Sunday, Feb. 7, from 1:30 p.m. at Koyasan Beikoku Betsuin of Los Angeles, 342 E. First St. in Little Tokyo. Koyasan Buddhist Temple will invite Fuku Otoko (Lucky Man) and Fuku Onna (Lucky Lady) and perform mamemaki (throwing soybeans) following the Hoshimatsuri Goma service. This year’s Fuku Otoko will be Bishop Emeritus Taisen Miyata. He was born in the Year of the Monkey and has been a missionary Buddhist minister since 1959. Fuku Onna will be Sara Kuniko Hutter, the Nisei Week Queen for 2015-2016.